In one of the many music discussions/arguments my friend Brett and I have had in the nearly 10 years I’ve known him, one always sticks out: where 90s music fits in comparison to other decades. Born in ’78, my first jump into music was in the late 80s and intensified as the decade turned to 1990. I went through tapes, mix tapes, the era of CDs, and our current mishmash of whatever it is you call MP3s/Spotify/Pandora/streaming everywhere. But BMG Music, man, that’s where I really found music. You remember BMG, right? Get 11 CDs for 1 cent and just pay in full for the other? There was always supposed to be a limit per year, but by changing a family name, work address or just waiting for them to make another offer, you could load up a collection and fast. That’s where I found what was beyond the radio and MTV in an era where that’s all you had to find out what else was out there. That’s where I found Nirvana, the Smashing Pumpkins, Green Day, Dr. Dre, Snoop Dogg, Pearl Jam, the Wu Tang Clan, Red Hot Chili Peppers, and plenty before and after. My books got filled, my CD player ran non-stop, and life was good. Sugar Ray’s Mark McGrath & Everclear’s Art Alexakis in happier times. – Even pop bands have got into the act. 98 Degrees and Boyz II Men are supporting New Kids On The Block on their recent tour. I’m sure I’m forgetting and leaving out some, but what spurred this blog was the Summerland tour I saw this past weekend. The brainchild of Everclear frontman Art Alexakis, he helped kick things off last year with bands like Lit, Marcy Playground, and Sugar Ray with his own group headlining. In year two, Live, Filter and Sponge joined Everclear on a fairly expansive tour that saw over 35 dates this year. As a fan of three of the bands, it was a no-brainer, so my g/f and other good friend headed to Hampton Beach, NH, for a warm Saturday night of music that came out nearly 20 years ago. And without a doubt, the hits were there. This wasn’t a gimmick show where there’s a few songs you want to hear and you get a bunch of new tracks you’re not into. Alexakis said as much between sets in addressing the crowd. If the Summerland tour tagline was “You’ll get everything you want,” that would be apropos. I had the fortune to tell my friend Blaine that Ed Kowalczyk was no longer the lead singer of Live as the band is in quite a dispute with their former lead singer. But as we watched their seven song co-headlining set, we both came to the realization that we didn’t care who the new frontman was — they still sounded great. As the night went on, I couldn’t get the thought out of my mind that this is happening with more frequency to 90s alternative bands than most others that I can remember. Live: The aforementioned Pennsylvanians are now fronted by Chris Shinn, who is best known as being the son of New Orleans Pelicans’ owner George Shinn. He is also very talented. Fuel: Lead singer Brett Scallions left Fuel in 2006 and the rumor was then-American Idol singer Chris Daughtry might take over. That never happened and after a few lead singers and other member departures later, Scallions is leading a reformed Fuel and is touring. Alice In Chains: In one of the more discussed and eventually accepted shifts, William DuVall joined AiC in 2005, just a few years after Layne Staley’s death. They are also touring and put out one of my favorite rock discs in a few years, Black Gives Way To Blue, in ’09. Smashing Pumpkins: This is more in reverse, but lead man Billy Corgan is the only one that remains from the original foursome. It’s been hard to recapture the magic of those discs, mainly because of Corgan’s insistence on putting out A) too much music and B) music that isn’t connecting with anyone. I saw the latest incarnation of the group perform Oceania in full and then ripped into five or so hits. What do you think got over with the crowd more? A lead singer is essentially the band’s spokeman, the one who is heard the most and pretty much represents what the audience is supposed to know, feel and relate to. That’s why they call it ‘frontman’s disease’ and not ‘bass player’s disease’. There’s a certain swagger and attention one gets from being a lead singer, which is why it seems like such a freakin’ awesome job to so many people. But at some point, fans decided to not care anymore about who fronted these bands, but just that they started playing the music those old frontmen used to sing. It’s a weird phenomenon and one that I think gives the aforementioned Brett a leg up in our debate. However, there are plenty of 80s bands that have decided to undergo frontman facelifts. Van Halen (who went from Dave Lee Roth to Sammy Hagar to Gary Cherone back to Hagar and then back to Roth) and Journey come to mind, while Guns ‘n’ Roses went the route of Corgan with essentially only Axl Rose calling the shots. But imagine Pearl Jam without Eddie Vedder or the Chili Peppers without Anthony Kiedis or House Of Pain without Everlast (ok, maybe that last one doesn’t work). On the flipside, an interesting point of discussion is how revered the former two bands would be if their lead singer committed suicide instead of Kurt Cobain. 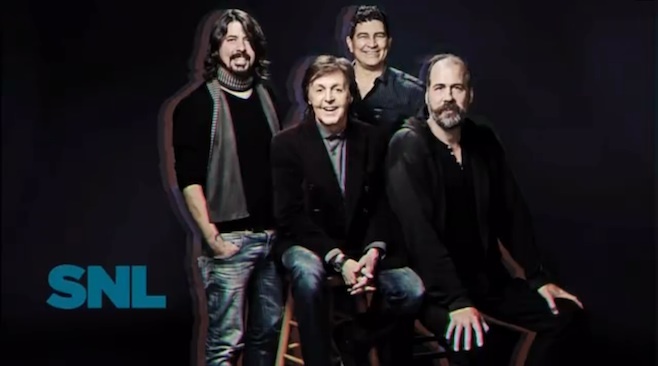 Had that happened, perhaps Sir Paul would have been belting out Black or Under The Bridge on SNL this season instead. As the summer winds down and more 90s tours emerge, I’m reminded of a sentiment I heard somewhere on a podcast: bands are becoming like blockbuster movies. The successful ones break up and eventually reboot so they can make tons of money. Perhaps this current decade of more prone to this phenomenon than others. Maybe it’s the talent or just a pure coincidence, but it’s happening and fans of this era of music don’t seem to mind. This entry was posted in Music and tagged 90s bands, Alternative Rock. Bookmark the permalink.